As state lawmakers convene to begin their 2018 legislative sessions, a series of license plate bills have been introduced. While some proposals expand current options or create new opportunities, several allow the issuance of a single, rear-mounted license plate. This legislation represents a continuing trend and is often an attempt by states to save money and conserve resources. Those owning hobby cars and trucks—new and old alike—overwhelmingly support these efforts. After all, vehicle owners are spared the burden of having to create mounting holes on original and fabricated bumpers and the aesthetic contours of collector cars are preserved. Illinois: Legislation has been introduced in Illinois to require the issuance of only a single, rear-mounted license plate for all newly-registered motor vehicles. As the legislature’s last session adjourned, legislation to provide that motor vehicles registered as “secondary vehicles” and driven less than 5,000 miles per year may display only a single plate on the rear of the vehicle died. That bill did not receive any consideration outside its committee of jurisdiction. Iowa: Legislation was introduced that allows model 1978 or older vehicles to display a single license plate on the rear of the vehicle. Current law allows single license plates on model 1948 or older vehicles. The bill also allows reconstructed or specially constructed vehicles built to resemble motor vehicles which are 1978 model years old or older to display a single plate. Maryland: Legislation has been introduced in Maryland to require the issuance of only a single license plate for all motor vehicles. New Mexico: In contrast to other states, New Mexico introduced legislation to require license plates on the front and rear of all motor vehicles (it currently permits a single license plate). The bill passed the House of Representatives, but fortunately died in the Senate as the legislature adjourned. This bill may be reintroduced in the 2019 session. Wisconsin: Legislation was introduced in Wisconsin that would allow vehicles manufactured without a front license-plate bracket and collector's special interest vehicles the option to display only a single license plate on the rear of the vehicle. Click here for the complete list of Legislative Action Alerts. John "Gunner" Gunnell (right) took his 1917 Oakland on the Yellowstone Trail’s Wisconsin section in October 2017 with friend Dave Sarna (left). Several weeks after their charity tour, the car was put on display at the Wisconsin State Capitol during a Centennial Gala celebrating the historic building’s own 100th anniversary, as pictured here. For an antique auto aficionado, John "Gunner" Gunnell is truly “livin' the dream,” as he says. Last October, he raised over $7.000 for the Wisconsin Lions camp for blind and disabled children with his 1917 Oakland car. The journey started at the Hudson Arch, headed eastward to Waupaca and southward to Kenosha. The finish line was set for Gateway Classics nearly a week later. Driving the car was mechanic and friend Dave Sarna, a former automotive technology instructor at Fox Valley Technical College. The charity run was formed in 2015 when John purchased the Oakland as one of his dream cars. Having already bought a building that was a former Oakland dealership and Yellowstone Garage in Waupaca, Wisconsin, the vehicle’s connection was clear. The decision was made with Sarna to drive the Wisconsin section of the historic Yellowstone Trail, which runs 409 miles. Sarna—a proud Manawa Lion—and Gunnell tied in the 100-year-old car with the 100-year anniversary of Lions Clubs International. As one might imagine, mechanical troubles during the trip were unavoidable. Just prior to embarking, the duo had overhauled the car’s rod bearings and installed a clutch. However, Oakland specialists were called in to supply parts by overnight mail to keep the car going. A fresh battery was also needed on the road. People along the route helped the travelers as well. The trip was supported by a Waupaca radio station that broadcast historical information about the Oakland and Yellowstone Trail surrounding the tour. No stranger to the hobby, Gunner was on the staff of Old Cars Weekly magazine from 1978-2008. His tenure included roles as publisher and editor. The published author also counts 85 books about cars and trucks to his credit. These days, the freelance writer contributes to many well-known titles. John also wrote to his state lawmakers earlier this year in support of a bill allowing the purchase of salvage vehicles at auction. He explained the recent charity tour, adding that “car hobbyists cannot do positive things such as these unless we are able to practice our hobby, part of which includes the restoration of salvage vehicles.” Follow along with his exploits online at Gunner's Great Garage. Gunner, your vast experience with four wheels has really come full-circle. Many thanks for sharing the inspiration with others! 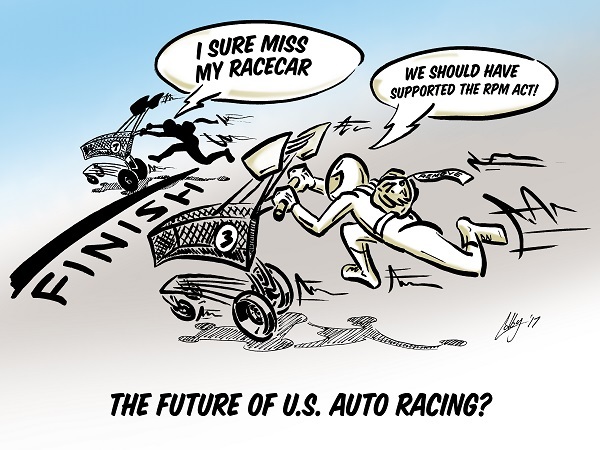 Stay Up-to-Date on the RPM Act: Get the latest information on the motorsports bill at www.sema.org/epa-news.